Current and future quality managers and decision makers gain the knowledge and skills they need to achieve organizational excellence. With a focus on continually developing the quality of people, processes, products, and the work environment, it covers all pertinent quality-related topics, including: an overview of quality, quality and global competitiveness, strategic alliances, establishing a culture of quality, customer satisfaction and quality, employee empowerment, leadership and change management, team building and teamwork, education and training for quality, overcoming internal politics and conflict, quality tools, problem solving and decision making, quality function deployment, statistical process control, continual improvement methods, such as six sigma, lean, and lean six sigma), benchmarking, just-in-time/lean manufacturing, and implementing quality. The new edition features an improved artwork package; updated critical-thinking activities; and new material on managing quality in the supply chain, change to ISO 9000-2015, Lean, and Lean Six Sigma, QFD, SPC. Dr. David Goetsch is a full professor of Quality, Safety, and Business Management. He is the author of 75 books, six of which have been translated into foreign languages including Korean, Indonesian, Spanish, and Malaysian. Dr. Goetsch spent ten years in the private sector in quality-related positions before entering higher education full-time. His other books include Total Quality Handbook, Implementing Total Quality, Understanding ISO 9000 and ISO Standards, Occupational Safety and Health, Basics of Occupational Safety and Health, and Project Management for Engineering and Technology. Stanley Davis is a former manufacturing executive with Harris Corporation and an adjunct professor of quality. 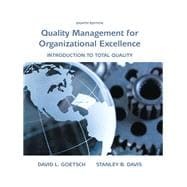 He is co-author of several other books with Dr. Goetsch including Understanding ISO 9000 and the ISO Standards and Implementing Total Quality.